English Language Learner (ELL) public school students who successfully complete English as a Second Language (ESL) or bilingual education programs within three years appear to fare better in meeting basic math and reading proficiency standards than long-term ELLs, according to analysis of a unique longitudinal dataset that tracks all Texas students from first grade through high school graduation and beyond. Interestingly, Hispanic ELLs who opt out of ESL or bilingual education programs in favor of English-only courses may be particularly disadvantaged in terms of college enrollment. 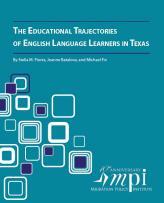 This report looks at Texas, which has the second-largest number of ELL students in the nation, to examine the trajectories and performances of different groups of ELL students (the on-time cohort and ever-ELL cohort) compared to their native-English peers. The report also finds that students' graduation from high school may be more closely correlated with race and ethnicity than ELL status; and that the outcomes of ever-ELLs in the on-time cohort are far superior to those of the entire ELL cohort. C. Predicting College Entry for Ever-ELL Students: What Factors Matter the Most?